The life of the typical entrepreneur is incredibly hectic. Startup business owners tend to face a rockier road than others due to the tasks associated with launching a brand new enterprise. But the path doesn’t become much smoother from there. In fact, a recent study indicates that an entrepreneur’s average workweek of is 63 percent longer than a common employee who puts in 40 hours per week. Because of this, many entrepreneurs integrate the following time-saving tips into their lifestyle. While the majority of people are still sleeping at 3:45 a.m., Apple CEO Tim Cook is sorting and reading his latest emails. Michelle Obama has already begun her daily workout by 4:30 a.m. and Indra Nooyi, CEO of PepsiCo, is always in her office by 7:00 a.m. sharp. As you can see, it pays to get a head start on the day. Certain individuals are able to rely on a sort of natural alarm clock. By utilizing the body’s inherent circadian rhythm, these people are able to regulate their sleeping habits and wake up without the use of an alarm clock. Although they might not be able to awaken at a specific time each and every morning, their margin of error is usually close enough to work with. Fortunately for those who do depend on a mechanical or electronic clock, today’s alarms aren’t nearly as obnoxious and annoying as they once were. The traditional sound of a metal hammer striking a bell, while certainly effective, has given way to gradual signals, soothing human voices and environmental sounds from the rainforest. Entrepreneurs are also known for maintaining consistent schedules. Checking emails, cooking breakfast and showering tend to be amongst the first items on most daily agendas. Not only does this let you establish a concrete routine, but it can help eliminate any indecisiveness you have. Relying on a day-to-day schedule can even affect your productivity. Once you map out your schedule, you’re likely to find gaps ready to be filled with other activities. Try to use this time to your advantage by reading or studying. Those who want to bolster their career even further might spend some of their newfound free time in the office. Depending on how far you have to drive, your daily work commute can be a real source of frustration. Since the trip usually takes place early in the day and again at the end of your shift, it’s far too easy to let the inconvenience turn into a serious stressor. However, there are a number of steps you can take to ease some of the tension and trouble over a lengthy commute. Commuters sometimes find it useful to sing along with their favorite songs while driving. This is a great way to inject some fun into a boring commute. Depending on your skill level, however, this one might be best reserved for solo trips. Other ideas include learning a new language, listening to audiobooks and creating an audio journal. Sharing your commute with a coworker is another great method to stave off the boredom and monotony of the daily drive. Carpooling can also save you money, increase the longevity of your vehicle and even help protect the environment. Prioritization goes hand-in-hand with the implementation of a daily schedule. Entrepreneurs who have the luxury of a personal assistant can delegate some of these activities, but many aren’t that lucky. In this case, there’s no other solution but to rank your responsibilities according to their importance and work your way down the list. Unfortunately, this process is rarely that straightforward. Some prefer to prioritize their daily activities from easiest to most difficult. Finishing up smaller, menial tasks at the beginning of the day will leave you with plenty of time to focus on bigger tasks. Conversely, tackling the large jobs and major responsibilities upfront can eliminate some of the day’s stress right from the start. It’s ultimately up to you to choose the approach that works best. Business consulting firms are an excellent go-to for young entrepreneurs and startup brands. Apart from their awareness of current market trends, organizational management and regulatory compliance, consulting services can even help create, develop and refine your initial business model. Startup enterprises and new business leaders stand to benefit immensely from a consulting service. While generalized firms can help you in a variety of different areas, you can call specialists in to handle specific functions such as finance, human resources or information technology. Other consultancy roles exist for nearly every business operation and activity imaginable. This may sound counterproductive, but research shows that those who take short naps of 20 to 30 minutes throughout the day tend to be more alert and energetic than those who don’t. In fact, it’s rumored that Leonardo da Vinci took a 15-minute nap every four hours, thereby granting him six more hours per day. Thomas Edison was thought to follow similar sleeping patterns. Despite the effectiveness of regular naps, the majority of traditional employers do not accommodate the practice. While it really isn’t feasible on any kind of large scale, some proactive companies have implemented quiet spaces and nap rooms for their staff. Employers such as Ben & Jerry’s, Zappos, Nike and even NASA all provide their employees with the option of napping throughout the workday. The entrepreneurial lifestyle isn’t for everyone. Although it can be incredibly rewarding and exciting, it’s a role that demands a strong attention to detail, unwavering dedication to your business and the ability to multitask on a day-to-day basis. 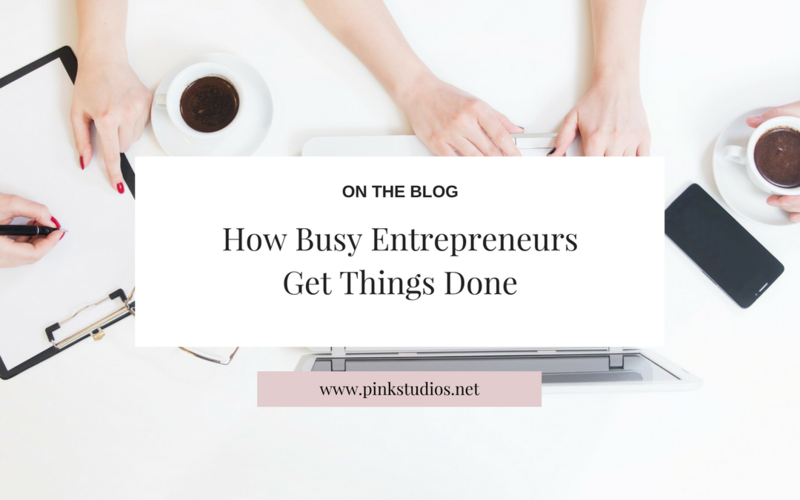 Pink Studios offers a range of social media, consulting, web design and other marketing services to help busy entrepreneurs keep up with the daily demand. For those who are able to handle the fast-paced nature of the entrepreneur, however, success waits just around the corner. YES! thats key and has worked wonders for me. It’s hard – but coffee and the end-result makes it all worth it. I’m rooting for you!